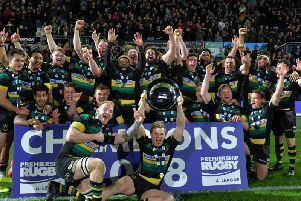 George Pisi has revealed family and potential finals were his main motivations for snubbing advances from elsewhere to stay at Saints. Pisi was strongly linked with a switch to Top 14 side Castres, with French money an increasing pull for Aviva Premiership players. But he opted against moving back to France, where he spent time with Clermont Auvergne before joining Northampton in the summer of 2011. Pisi was handed a new deal at Saints, signing on along with Stephen Myler, James Wilson and Tom Stephenson in a pre-Christmas announcement. It was a sizeable boost for boss Jim Mallinder as one of his prized assets, the 2011/12 player of the season, showed his commitment to life at Franklin’s Gardens. And Pisi is certainly comfortable with life at the club, admitting he is desperate to add more silverware to the trophy cabinet following last year’s double delight. “It’s good here,” said the ever-smiling Samoan centre. “My family’s here: my wife and my son. It’s a good club, a family-based club and I enjoy my rugby here. “We’re looking forward to winning more championships and that’s one of the main reasons why I wanted to stay at this club. Pisi does, of course, also have family on the field when he runs out at the Gardens with his sibling, Ken, also making a name for himself at Saints. And George - who jokes “I’m sick of that” when the subject of playing alongside his brother is brought up - has also formed close bonds with the other polynesian players at the club. Salesi Ma’afu and Samu Manoa are among a group of men with Islander heritage, though both of those big-hitters weren’t able to refuse a move across The Channel. And Pisi says he understands why his team-mates, and close friends, have opted to swap Saints for moneybags European champions Toulon. “It’s a bit tough, but they’re doing what’s best for their family,” he said. For Pisi, the time wasn’t right. He is an established favourite at Saints, for whom he’s scored 25 tries in 91 appearances. That record and his blockbusting midfield performances have made him a sought after talent. And the 28-year-old added: “There were offers elsewhere and in the end it was what was about what was best for my wife and son. “Staying put was right and we’re just enjoying our time here.